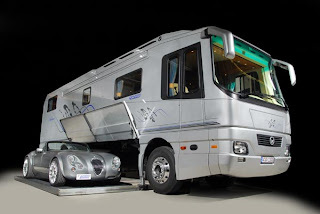 Now this is an RV. Volkner RV I never saw this before , but its an RV with a "garage" under neath where you can park a small car. No silly trailers, or towing behind. Its probably fairly complicated, like most things German , but it doesn't make it any less cool. If an RV is cool. 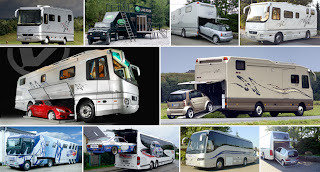 Driving an RV is a lot like driving your house down the road , but a lot of people seem to enjoy them. The trend-setting construction of the patented central garage of Volkner Mobil makes the taking along of different passenger cars possible - depending upon panel body length of the vehicle. In the type with an overall length of 10,5 m a Mini Cooper finds place. Even a taking along of Porsche 911, Jaguar XK8 Cabriolets, BMW 6er Cabriolet, Maserati Quattroporte or similarly dimensioned cars is made possible in the Performance type with an overall length of 12,3 m.
The chassis is adapted to the needs and requirements of our customers and made in our enterprise. All racing car trucks are planned detail-exactly according to the customer’s need and fixed to their individual requirements. The racing car truck is e.g. based upon a Mercedes Benz Travego Bus 17 RHD. The panel body length is 13,8 m. This model makes the taking along of different large racing cars possible. A crane installation loads the car into the tail of the truck.